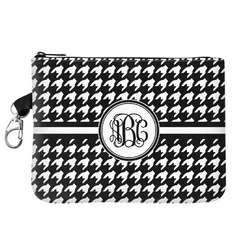 Perfect bag for keeping divot tools, ball markers, tees, and more! This is the perfect accessory for any serious golfer. There are always tiny things you need to carry with you for your perfect game of golf. 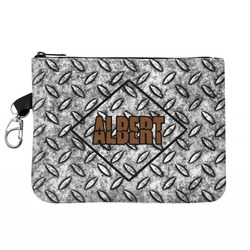 It's great for divot tools, ball markers, balls, and more! 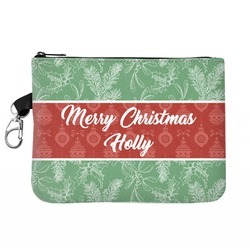 This great little bag measures at about 7" W x 5.5" H. This bag is made of a sturdy and durable fabric that can either be printed with a personalization on both sides or simply on one side with the back being black. There is a zipper closure on the top to ensure safe keeping for your golfing tools. It is a great bag for all your small golfing necessities from divot tools to tees. It even has a nickel clip so that you can clip it to your golf bag for easy access. Go into the design center to get started. Choose one of our premade designs to help you get started. Change anything from the background to the ribbon to the frame or text! Change a little or change it all. Just make it yours. We are right here by your side if you need any help. If you're interested in this golf bag, then you're probably interested in everything you can store inside! Be sure to check out our Golf section where you'll find everything you need for a day on the green, such as personalized divot tools, soft golf towels, fun putter covers, golf tees, and more. Go into our Sports + Activities section to find more sports equipment like yoga mats and waterbottles.